Writing an Executive Memos can be a bit of a challenge. It’s a great way of communicating with other members in your organization if meeting each other to discuss Business Memo is not really an option. Having said that, you should be perfectly clear on what you want to convey to them since you are not having this discussion in person. You can shed the worry of not getting the memo right by using our freely available Memo Templates. 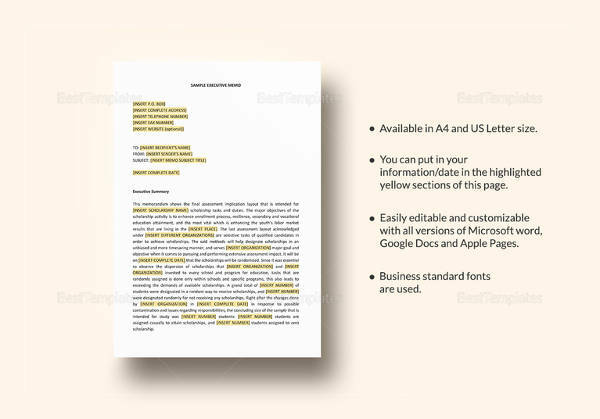 They are easy to download and easy to edit, making writing an executive memo template a piece of cake. 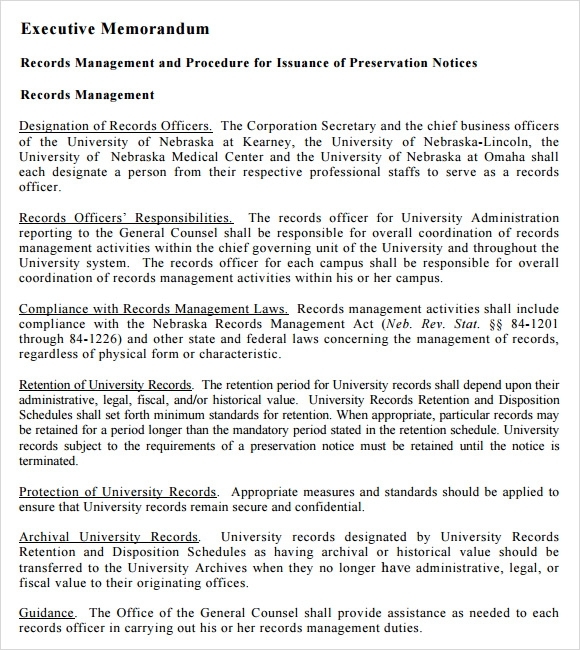 The executive memorandum provides you with the sample memorandum of a university. 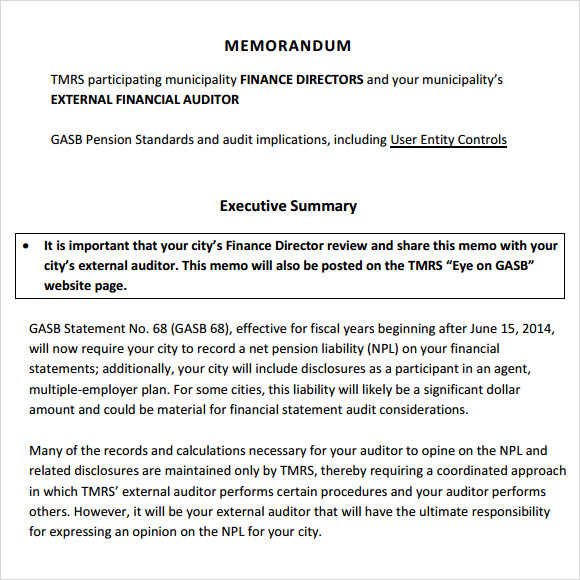 This memorandum provides information about the record management and the procedure of issuance of preservation notices. The information provided is crisp and precise; also the presentation is very clear and organised. 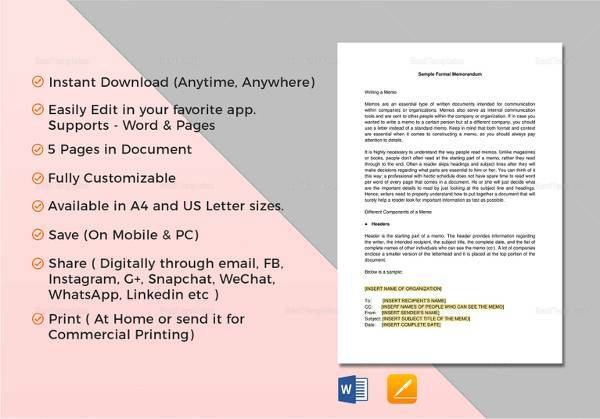 The executive memo format provides you with the format of an executive memo so as to help you in writing your own executive memo with ease. 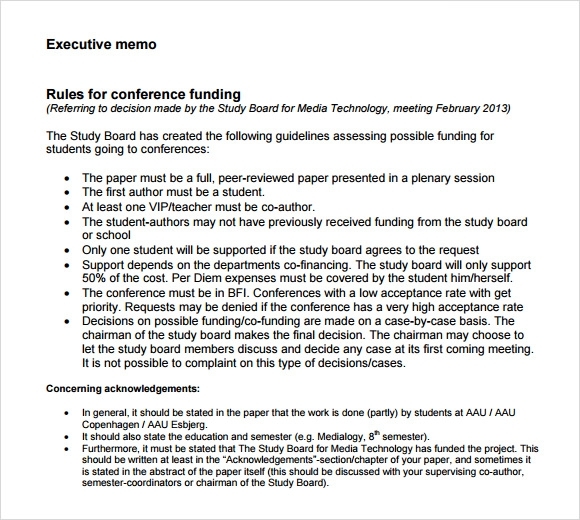 It also highlights the executive summary along while providing the appendix for the help. 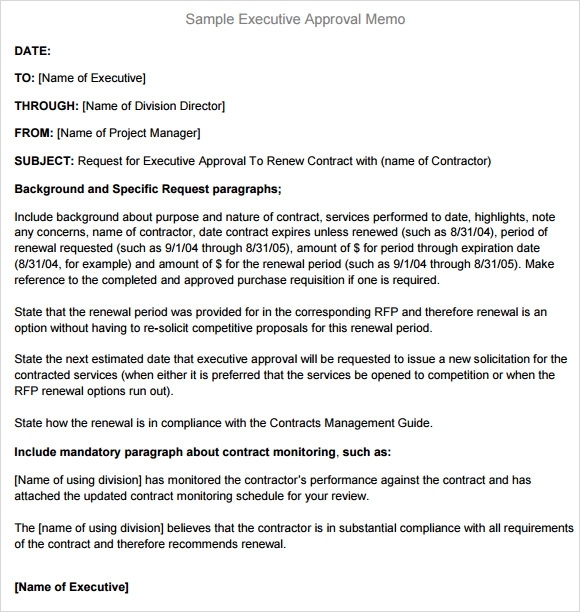 The sample executive approval memo showcases the executive memorandum specially designed for approvals. It highlights the information about the memo like the date, given to, given from and reference along while featuring the executive summary and content related in an organised way. Why is the Executive Memo Template Needed? 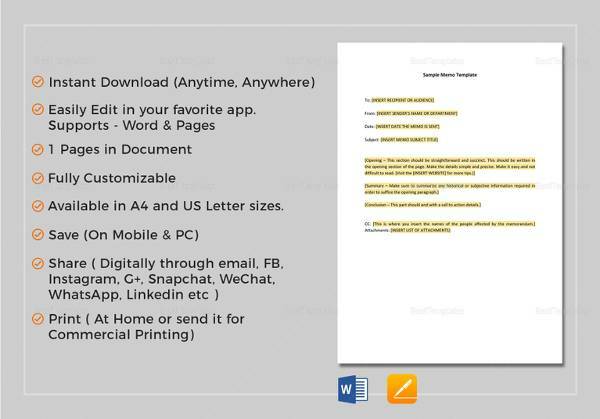 The executive memo template is needed for drafting an effective executive memo with ease. This Professional Memos makes sure to provide you utmost assistance while drafting the executive memo. It helps in giving you an idea of what all an executive memo should include and how it should be presented so that it doesn’t look like a mess and gives out a clear and understandable message. It also features that what all details should be highlighted for the ease of readers. An executive memo is needed for a variety of purposes and this template helps you in drafting them without any inconvenience. When is the Executive Memo Template Needed? 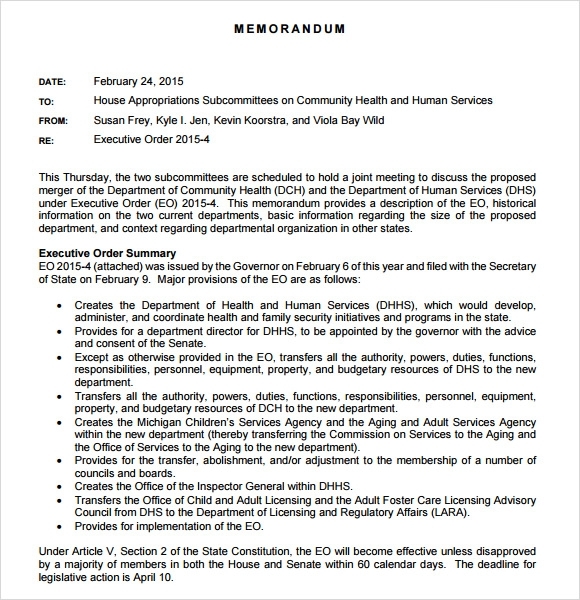 The executive memo template is needed when you need to give out the orders or message so as to manage the actions or policies of any department. It is needed to internally communicate with the members of a concerned department. It is the best way to discuss the things like any policy, strategy, plan, action or suggestion when you are not able to hold the discussion in person. This template is already formatted and makes sure to convey the entire message in a clear manner so that all the members can understand it with ease. 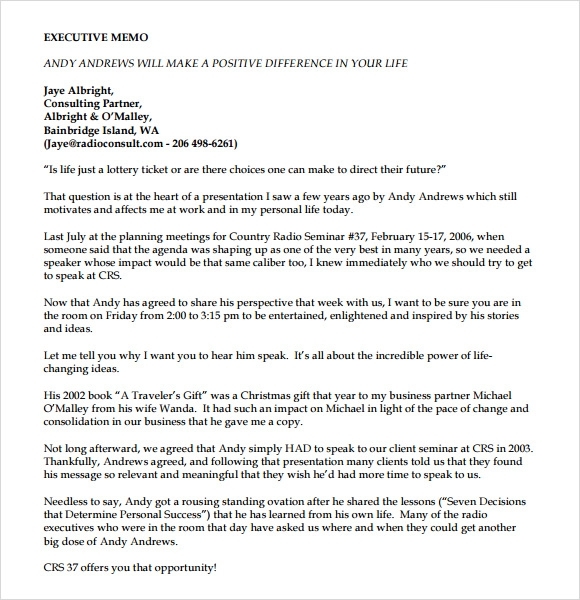 You may like Business Memos. 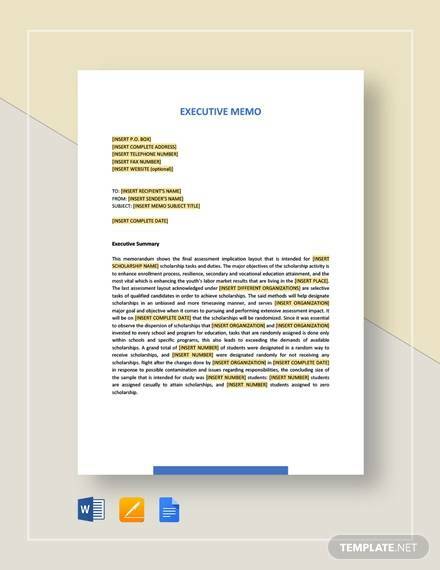 The executive memo template has various benefits like it helps you to communicate with the members easily and convey the message intended without any inconvenience. It also helps in making the communication faster and effective if you can’t hold the discussion in person. It aims at saving the time as all the members can get the information at the same time by various methods like a memo can be given be to each member or it can be displayed on the bulletin board so as to make it available within everyone’s reach. 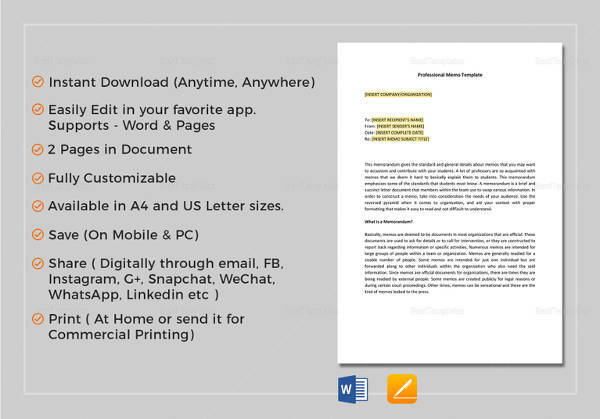 The executive memo template can easily be downloaded and used. It helps you in drafting an effective memo without taking much time. The various designs it comes in makes sure to suit your distinct purposes and needs while drafting the memo. This template can also be edited and customised without any hassle.